Neroli oil is heady, sweet, and floral, and is made from the aromatic blossoms of the orange tree. 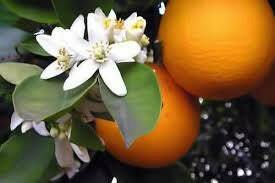 It takes approximately 1,000 pounds of orange blossoms to make one pound of neroli oil. Used for centuries to combat plague, fever, and nervousness, neroli is a one of the most user-friendly oils there is. It helps regenerate skin cells, improves skin elasticity, and even helps with acne, scarring, and stretch marks. Internally, neroli acts as a natural tranquilizer, and can relieve chronic anxiety, depression, and stress. Besides being a beloved oil by aromatherapists all over the globe, neroli is also often used in bridal bouquets, both as a symbol of purity, and for its ability to calm the bride’s nerves. Acne, antispasmodic, anxiety, aphrodisiac, circulation, depression, headaches, hysteria, insomnia, lethargy, mature skin, menopause, neuralgia, panic, premenstrual discomfort, scars, shock, stress and stretch marks. For acne, wet a cotton ball, then apply a few drops of oil. Dab affected area lightly. To fight lethargy, use 2-3 drops in a diffuser. As an antispasmodic, use 2-3 drops in a diffuser or 4-5 drops in a blended massage to improve colon problems, diarrhea, and nervous dyspepsia. To alleviate anxiety, depression, hysteria, lethargy, panic, shock, and stress, use 3-4 drops in a diffuser. Can also use 8-10 drops in bath water. For headaches and neuralgia, use 3-4 drops in a hot or cold compress (whichever works best for you). To ease premenstrual discomfort and distress, use 3-4 drops in a diffuser or 8-10 drops in bath water. To regenerate skin cells and improve skin elasticity for mature skin, mix a drop or two with an application of an unscented face cream, and apply as normal. To help with the irritability and tearfulness that can accompany menopause, use 3-4 drops in a diffuser or 8-10 drops in bath water regularly. Can also mix 3-4 drops with 1 ounce of carrier oil and massage on body. To help diminish scars and stretch marks, mix 3-4 drops with liquid lanolin and massage into affected areas. Bergamot, Frankincense, Geranium, Grapefruit, Jasmine, Lavender, Lemon, Lime, Orange, Rose, Rosemary, Sandalwood, Tangerine and Ylang Ylang. Because of its calming and almost tranquilizing affect, do not use when a clear head is needed, or before driving a vehicle or operating other heavy machinery. Beautiful scents, very nicely packaged. Thank you, seller! Love the oil. Shipment was very slow. Ship date changed while I was waiting on order. A wonderful aroma at a reasonable price! Thank you!